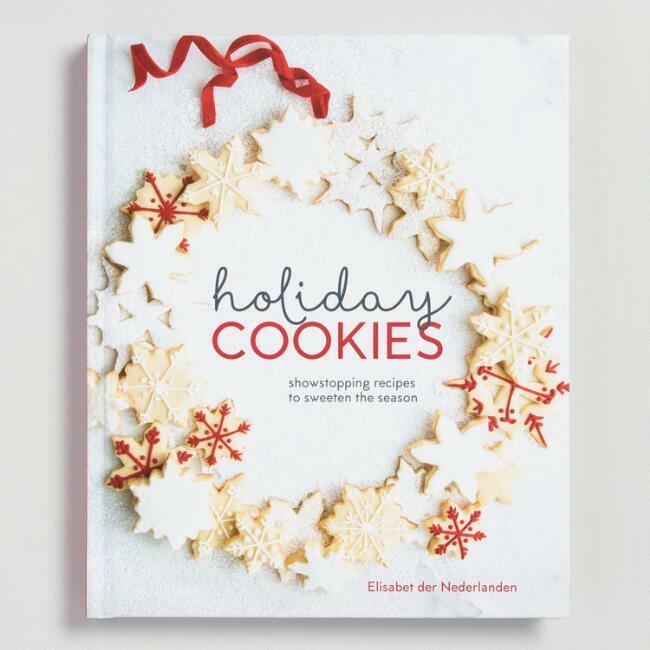 Treat Yourself to One or More of Our GREAT Programs! Imagine a world where every rip in a pair of jeans, every snag in a sweater and every tear becomes an opportunity for a one-of-a-kind creativity. Join Karen Stevens on Thursday, November 29 at 6:30 PM as she presents a fun introduction to unconventional mending techniques. She will show you that anyone can give worn and torn items a new life. Please bring an item of clothing to be mended, either jeans or a shirt, woven fabrics, not knits, please. If you have a favorite sewing kit or scrap fabric please bring this along as well. If not, these materials will be provided. 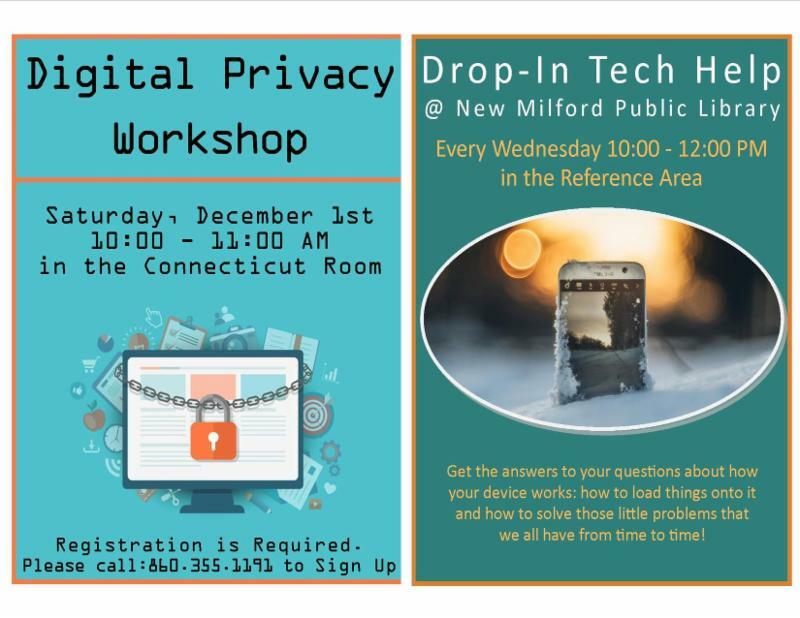 Registration is required at 860-355-1191 x 2 or newmilfordlibrary.org. 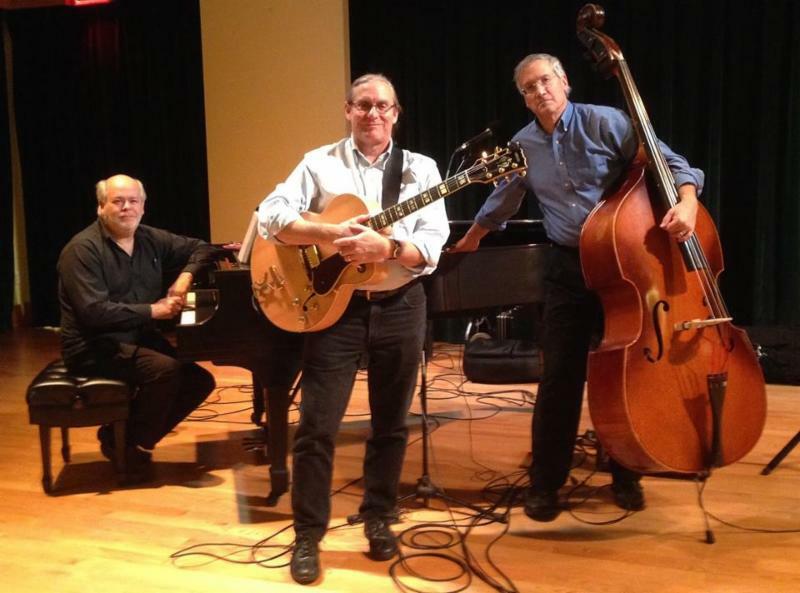 Nobody jazzes up the holidays like The Pierce Campbell Trio, appearing at the New Milford Public Library, on Wednesday, December 5 at 6:30 PM. This Trio features former Connecticut State Troubadour, Pierce Campbell on guitar and vocals, Tony Pasqualoni on acoustic bass and Loren Evarts on keyboards. They will be performing classic holiday songs for the holiday season from artists like Duke Ellington, Frank Sinatra and Tony Bennett. With excellent vocals, improvisation and a stellar song selection, they have an energy and sound that will engage you right from the start. 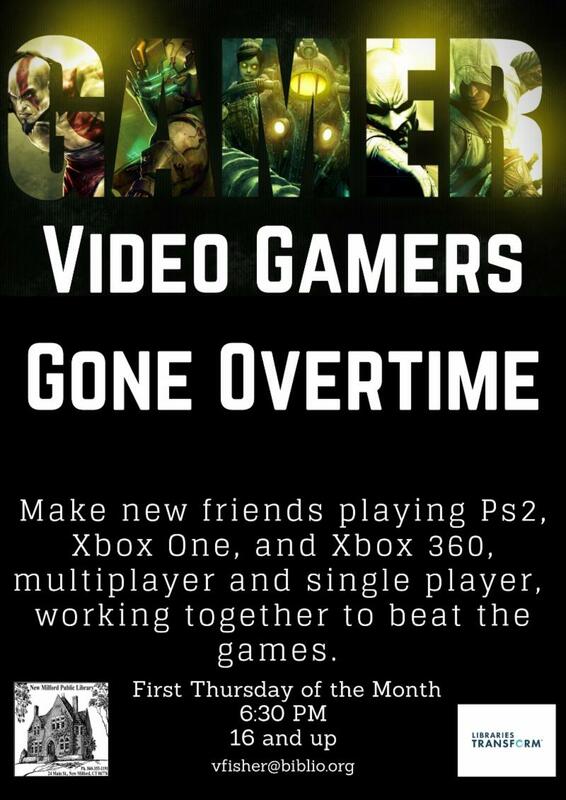 Bring your voice and sing along! Following a recent concert, one concert-goer noted, “Pierce Campbell’s Jazz Trio Holiday Program is a delight for patrons of all ages… Flawless, fun music combines with a festive spirit that will leave you in the mood for that most wonderful time of the year.” This program is made possible by the generosity of the Friends of New Milford Library. 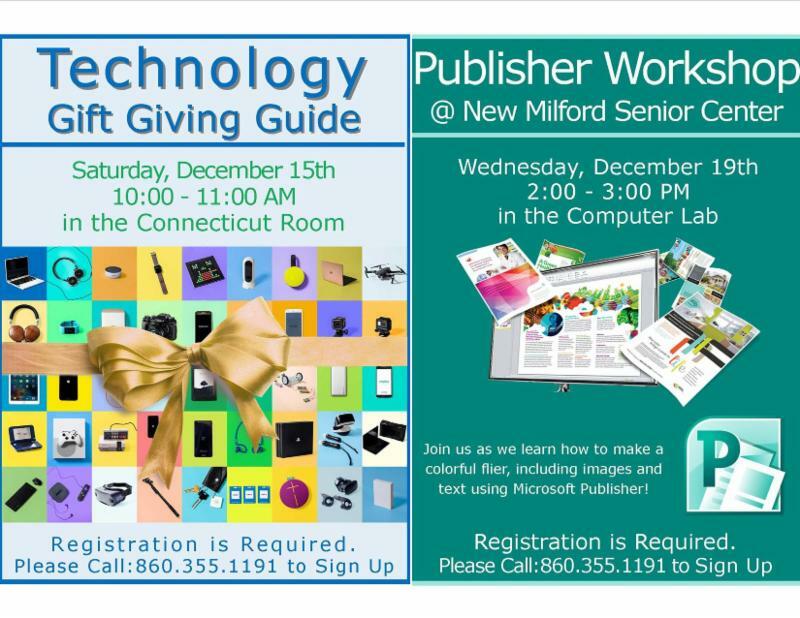 Registration preferred 860 355 1191 x 2 or online newmilfordlibrary.org. 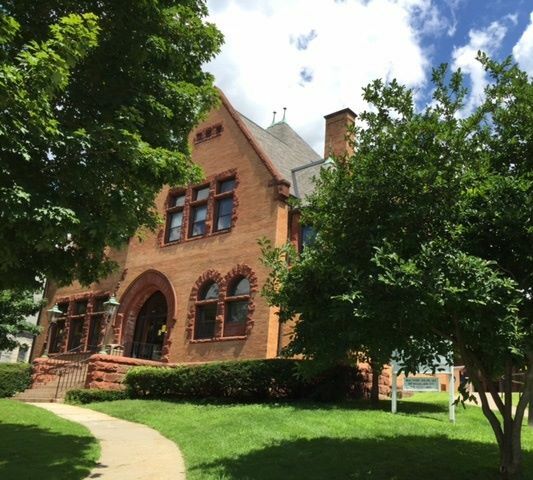 Join members of the New Milford Garden Club, at New Milford Public Library, to create a holiday arrangement with fresh greens and artificial decorations. 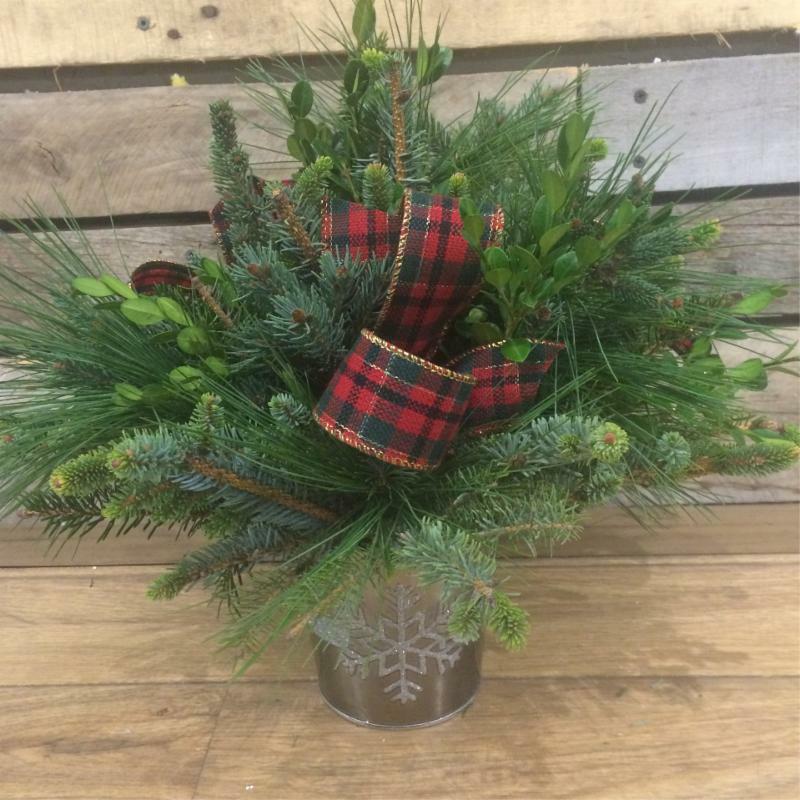 Participants are asked to bring pruning shears or scissors and a box to take your arrangements home. All other materials will be provided. This program is limited to 20 participants and preference will be given to those who were on the waiting list for the July program. The film is about a teenage Dutch boy, named Michiel van Beusekom, who tries to assist the Dutch resistance during World War II by helping a British airman stay out of German hands during the Nazi occupation of the Netherlands. Michiel feels resentment towards his father, the mayor, who is seemingly only interested in maintaining the status quo between the town and the German Army. However, Michiel worships his Uncle Ben, an adventurer in contact with the local resistance. 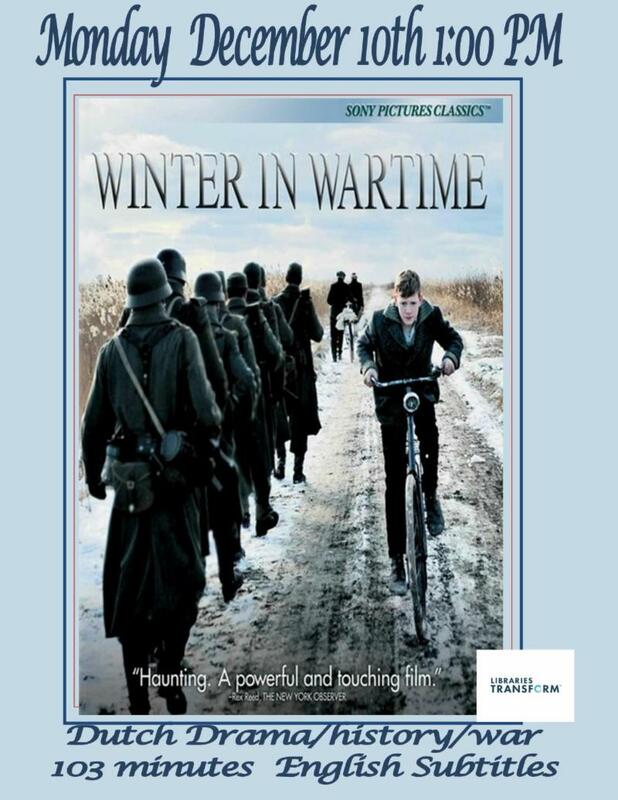 During the winter of 1944-1945, Michiel’s loyalties are tested. One of the villagers, Dirk (the elder brother of Michiel’s best friend), helps the airman, Jack, but Dirk is later arrested. Before his arrest, Dirk gives Michiel a letter to be delivered to Bertus, the village blacksmith. Before Michiel can deliver the letter, Bertus is shot and killed by the Germans. Michiel opens the letter, which directs him to Jack’s hiding place in the forest. Jack is injured, and Michiel enlists the aid of his sister Erica, a nurse, to take care of him. Jack and Erica soon develop a romantic relationship. Michiel’s father is arrested when the body of a German soldier, killed by Jack on the night of the plane crash, is found in the forest. Jack wants to turn himself in to save Michiel’s father, but Ben tells Michiel he (Ben) can save his father. However, Ben’s efforts fail, and Michiel’s father is shot by the Germans along with two other men as reprisal for the death of the soldier killed by Jack. Michiel tries to take Jack to the town of Zwolle, across a river, but the Germans foil their attempt, and the two narrowly escape after a chase through the forest. Michiel finally turns to his Uncle Ben for help in getting Jack to Zwolle. Ben agrees, and Ben, Jack, and Erica set off for the bridge to Zwolle. As they leave, Ben tells Michiel that Dirk should never have gotten Michiel involved with Jack. After they go, Michiel realizes that he had never mentioned Dirk’s role to Ben. Quickly checking Ben’s suitcase, he finds papers showing that Ben is working for the Germans. Rushing to the river, Michiel stops the trio, grabs Jack’s pistol, and confronts Ben. While Michiel guards Ben, Jack and Erica succeed in making it across the river to Zwolle. Ben tells Michiel that he had arranged for his father to be released, but that his father refused to let another villager be shot in his place. Ben attempts to escape to a passing German patrol, but Michiel shoots and kills him. A few months later, Allied soldiers enter the village and are rapturously welcomed by the villagers. One of the soldiers brings a letter for Erica, presumably from Jack. During an April 1943 bombing mission against the Japanese-held island of Nauru, Louis “Louie” Zamperini is flying as a bombardier of a United States Army Air Forces B-24 Liberator bomber when his plane is damaged in combat, with a number of the crew injured. The pilot, Phil, brings it to a stop at the end of the runway suffering from an exploded tire. As a young Italian-American boy in Torrance, Louie misbehaves by stealing, drinking liquor and smoking. He is often picked on by others due to his Italian ethnicity. His brother Peter sees how fast Louie can run and decides to train him to be a runner. Louie becomes disciplined and becomes a distance runner, earning the nickname “The Torrance Tornado”. Louie comes in 8th in the 1936 Summer Olympics and sets a record in the final lap for the 5,000-meter race. Returning to 1943, Louie, the surviving crew and several replacements are sent on a search-and-rescue mission with a plane previously used for spare parts. One left engine fails, while the crew bungles the remaining engine, and crash in the ocean. Louie, Mac, and Phil survive, living on two inflatable rafts. On the 27th day they attract the attention of a Japanese plane, which strafes and damages the rafts but misses them. Mac dies 6 days later. On the 47th day, Japanese sailors capture Louie and Phil. Now, prisoners of war, Louie and Phil are put in a Kwajalein Atoll dungeon. The Japanese ask Louie and Phil for information about E-class bombers and the Norden bombsight. Louie states they flew D-class and draws a rendition of a Philco radio. They are dragged out to disrobe and kneel on planks. Instead of an execution, they are crudely washed to ship them to Japan. Upon arrival, the two are separated and sent to different POW camps. Louie’s camp, Ōmori, in Tokyo, is headed by Japanese corporal Mutsuhiro Watanabe who is especially tough on Louie, beating him often. Louie is given an opportunity to broadcast a message home saying he is alive after learning the US government classified him as KIA. When refusing to broadcast a second message with anti-American propaganda, he’s sent back to camp where Watanabe has each prisoner punch him. After two years, Watanabe gets a promotion and leaves the camp. The camp is damaged when Tokyo is bombed, so Louie and the others are forced to move to Naoetsu prison camp. Louie discovers that Watanabe is, again, in charge and the prisoners are put to work loading coal barges. Louie pauses during work, so Watanabe makes him lift a large beam, ordering a guard to shoot Louie if he drops it. Louie successfully lifts and holds it up, despite exhaustion. This enrages Watanabe as Louie stares him straight in the eye, provoking him to beat Louie severely. At the end of the war, Louie and the other prisoners in the camp are liberated when the Americans occupy Japan. Louie tried to find Watanabe in his quarters but realizes he had fled. Louie sits down and stares at a picture of Watanabe as a child standing with his father. He is returned back home to America, Louie kisses the ground just as he arrives home to his family. At the end of the film, there is a slideshow that shows what happened after the war. The real Louis married and had two children. Phil survived, also marrying. Mutsuhiro “The Bird” Watanabe went into hiding and evaded prosecution in spite of being in the top 40 most-wanted Japanese war criminals list by General Douglas MacArthur. Louie lived out his promise to convert to Christianity, devote his life to God, believe in Jesus Christ and forgive his war-time captors, meeting with many of them. Watanabe, however, refused to meet with Louie. Louie had an opportunity to revisit his time as an Olympian when he ran a leg of the Olympic Torch relay for the 1998 Winter Olympics in Nagano, Japan. He was four days short of his 81st birthday. The stretch he ran was not far from one of the POW camps where he was held. 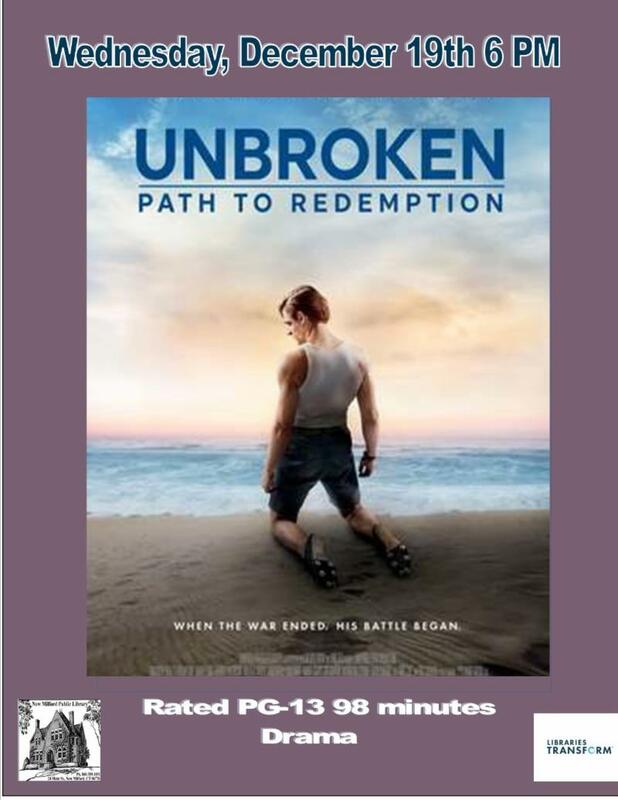 The closing titles reveal Louie Zamperini died on July 2, 2014, at age 97. Here’s your chance to visit with 8 current college undergrads with diverse majors and experiences. Join Independent College Counselor Francesca Morrissey of Access Success LLC as she moderates this question and answer session with our panelists. 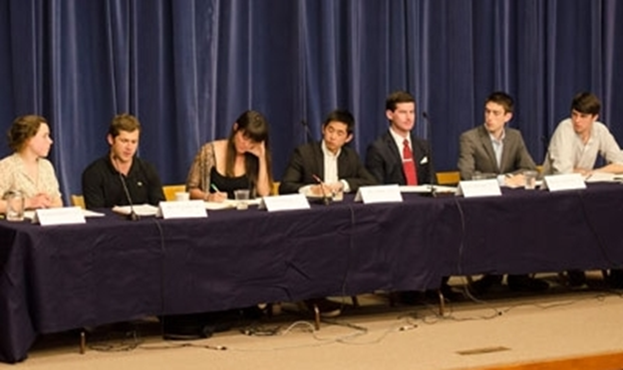 Our College Ambassadors hail from Boston University, Brown University, Fordham University, Hampshire College, Ohio Wesleyan University, Purdue University, University of South Carolina, and Villanova University. Come with questions and learn what they wish they had known about college while they were still in high school. 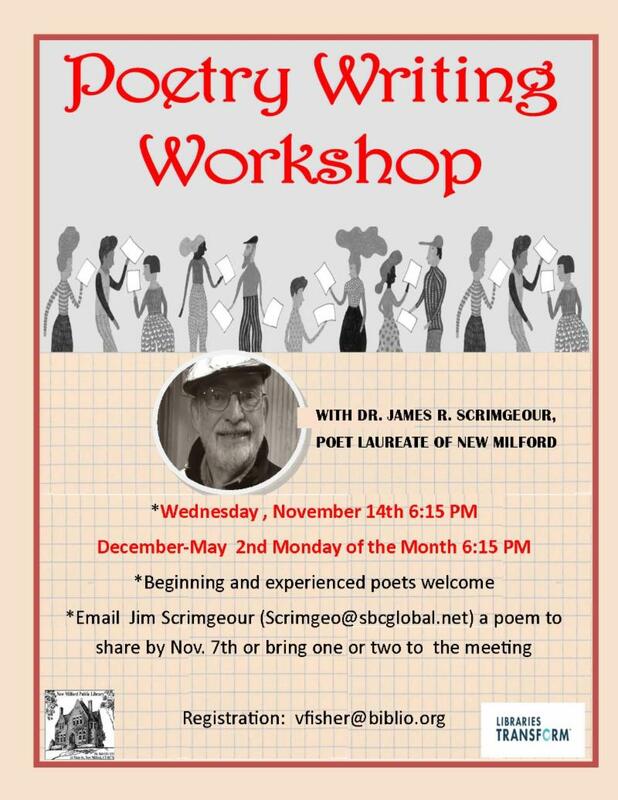 This program is for students in grades 9-12 and/or their parents. 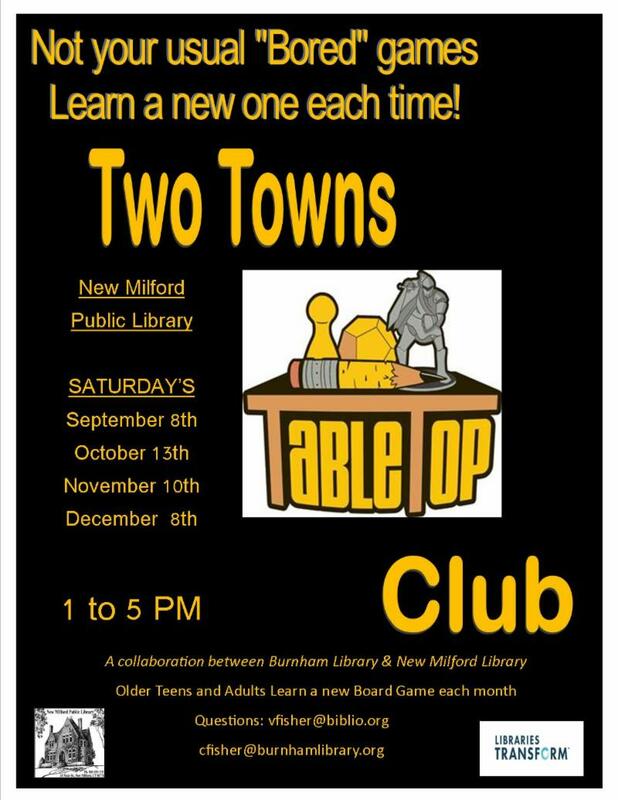 In place of our November 10th game club at New Milford Library, Two Towns Tabletop Club is holding a marathon gaming day for Extra Life on November 3rd from 2 PM until midnight at Burnham Library in Bridgewater. We are again to again having casual conversation with individuals and groups to record their take on what has connected them to the place they call home. 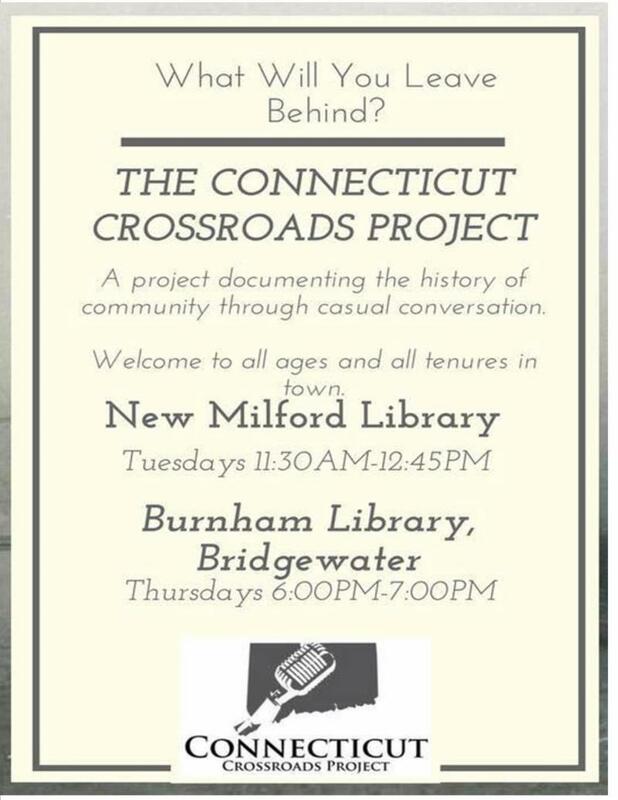 Help us capture what New Milford is like now and what it was like in your past by recording your memories. It is called the Crossroads because it is where personal memory meets public history. 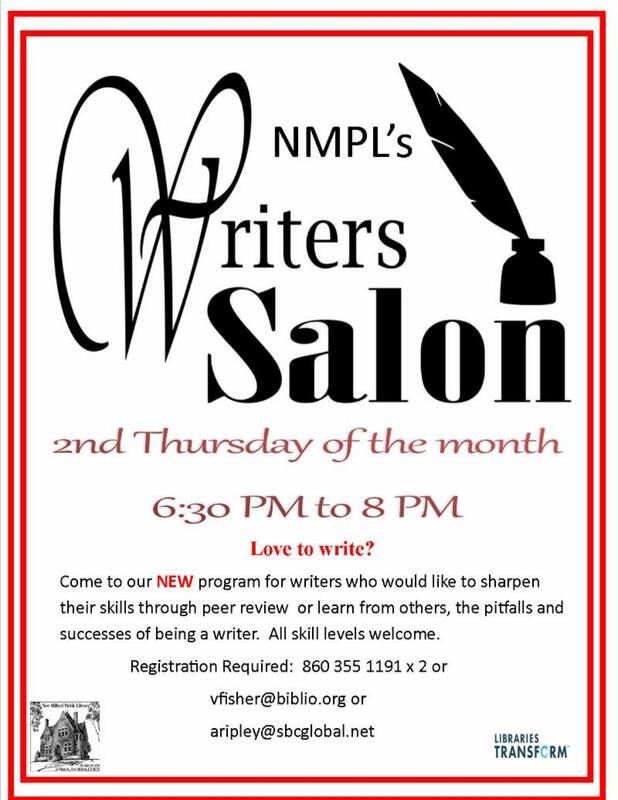 Feel free to schedule an appointment or drop in at the library vfisher@biblio.org or cfisher@burnhamlibrary.org.